Why did the chicken cross the Pacific? 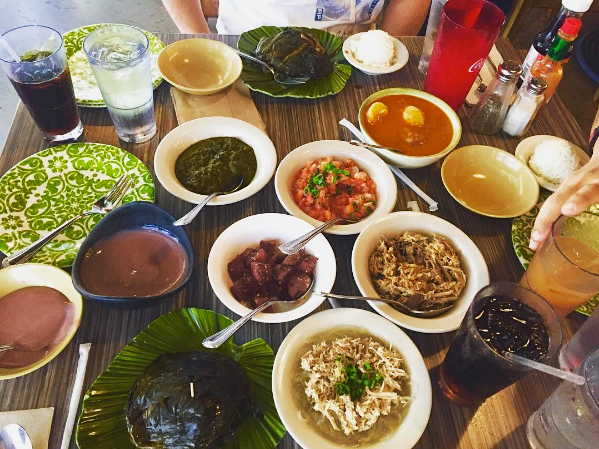 To make the bellies of Hawaiʻi people full and happy. Chicken is one of the tastiest sources of protein out there. When prepared with the right amount of tender lovin’, chicken becomes glorious, maybe even quasi-religious (chicken nuggets are a godsend). 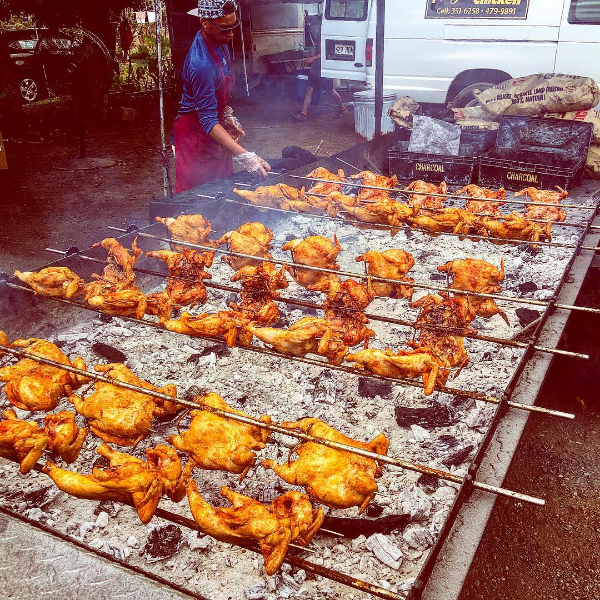 But while the continent may be familiar with traditional recipes like fried chicken, roasted chicken, and baked chicken, Hawaiʻi is blessed with a variety of cultures that attribute towards our favorite local chicken dishes. Heavily influenced by Asian cultures, these chicken dishes are best eaten here in Hawaiʻi, if not the actual origin country of the dish. Here are 11 chicken dishes that will have you planning your next trip to Hawaiʻi before you even finish reading this article. In Hawaiʻi, it’s not uncommon to be in the countryside and see tents set up along the highway selling pickled mango, dried aku, or in this case: Hulihuli chicken. Just the smell of its smoke brings back my childhood memories of driving by a hulihuli chicken cookout after a day at Bellows beach and picking up a couple chickens to eat back home. The word huli in Hawaiian means to turn or flip, so as you guessed, hulihuli refers to the method of constantly turning the chicken while it is being cooked. The process usually includes marinating the chicken in a spin-off sauce of teriyaki. The chickens are then roasted over kiawe wood until the skins are perfectly browned and ready to order. 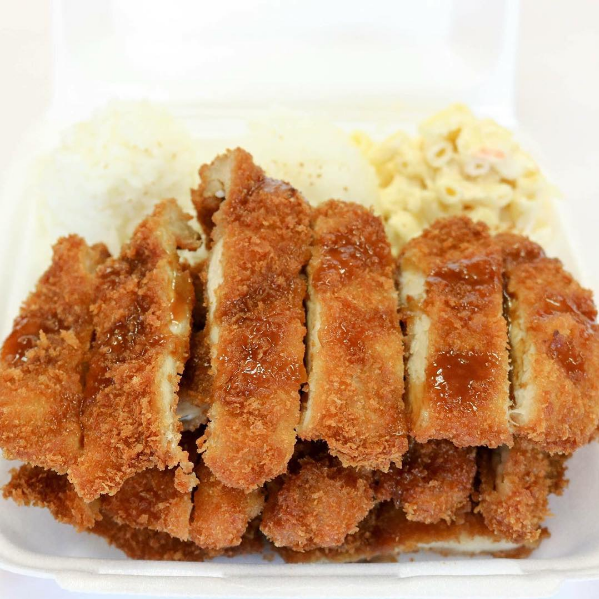 Chicken katsu is what Hawaiʻi locals like to call the Japanese dish, torikatsu. Like tonkatsu (pork cutlet), chicken katsu is a deep-fried chicken cutlet usually cut into strips and served with a tonkatsu sauce. What makes chicken katsu different from regular chicken cutlets is its use of the Japanese panko breadcrumbs. The panko creates a more flakey texture compared to regular breaded cutlets. 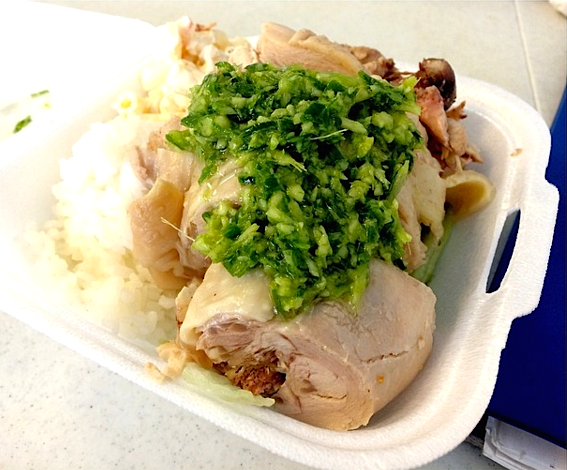 Say the words “garlic chicken” to anyone from Hawaiʻi, and I guarantee their mouth will start watering. Take note: this ain’t your mother’s garlic chicken. Though some of you idealize this chicken as being baked or even made in a slow-cooker, garlic chicken here consists of small pieces of fried chicken that are then drenched in a garlic and soy sauce. If you’re local, you should know that good garlic chicken skin should never be dry. 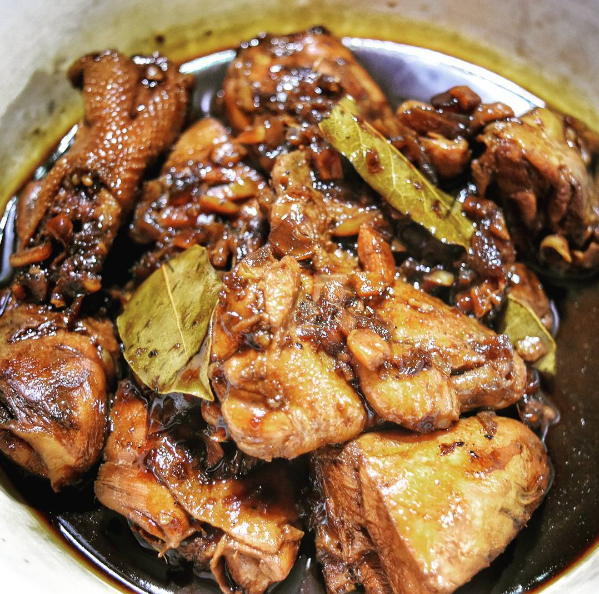 Adobo is a popular Filipino cooking process that involves pieces of meat, usually pork or chicken, that’s browned and then simmered in a soy sauce, garlic, and vinegar marinade. 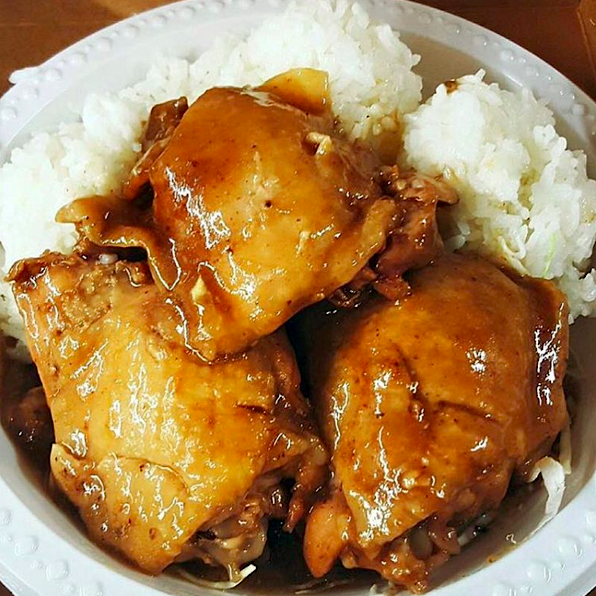 With a large population of Filipino folk in Hawaiʻi, it’s no wonder that chicken adobo has become a favorite among the islands. Although you can get it at any Filipino restaurant, I don’t think I’m the only one who’d agree that chicken adobo is best home-made. Growing up in Hawaiʻi, you learn to put furikake on anything to make it taste better: rice, fish, popcorn, fries, and of course, chicken. Furikake is a dry Japanese seasoning that includes flavors from ground fish, sesame seeds, seaweed flakes, and salt. Generally speaking, it gives food a slightly fishy taste. 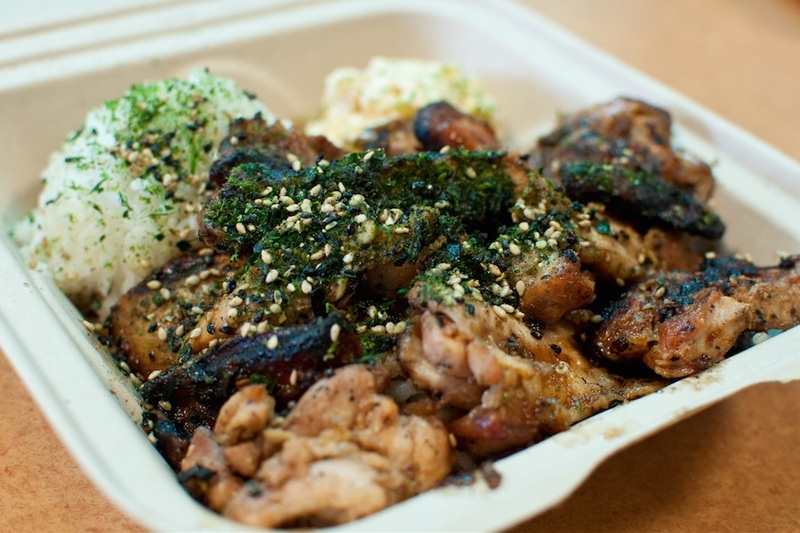 Furikake can make any type of chicken taste even better, whether it’s fried like the one from KJ’s Local Grindz, or broiled and grilled like the one pictured above from Uahi Island Grill. It’s not often that you’ll be served a cold chicken dish, but to many people that grew up in Hawaiʻi, cold ginger chicken is one of those dishes you loved coming home to. The whole chicken is cooked in a pot of boiling water, then cut and refrigerated. The sauce is made from garlic, ginger, green onion, sesame oil, peanut oil, and salt. It’s usually served with the sauce cold, although some may heat up the sauce in a pan and serve it over the cold chicken instead. 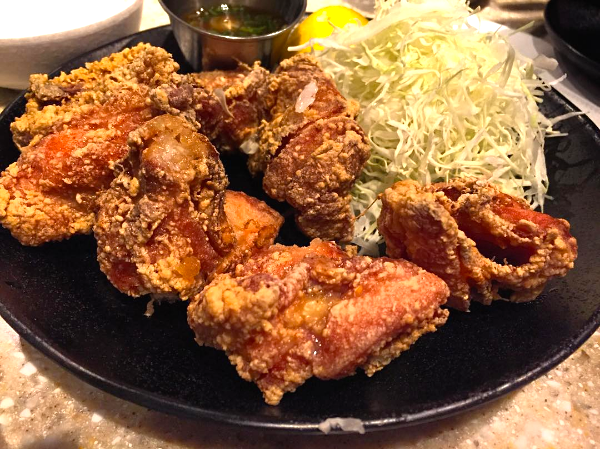 Chicken karaage is a dish that you’ll find in many Japanese restaurants here in Hawaiʻi. Karaage is a Japanese cooking technique that basically means to deep fry in oil. The chicken is cut up into small, boneless pieces and then fried until crispy. It’s usually enjoyed as an appetizer or a side dish complimenting a nice bowl of ramen or other Japanese delicacies. My personal favorite chicken kaarage is from Agu Ramen where it’s served with a ponzu dipping sauce and and a bed of thinly shredded. Many locals can agree that one of the best places to stop by to pick up your favorite chicken dishes after a trip away from home would be Zippy’s. Although they’re known for their reliable fried chicken, I believe their Korean fried chicken is a step above that. This chicken probably has no actual ties to Korean food, but its flavor shouldn’t be questioned. 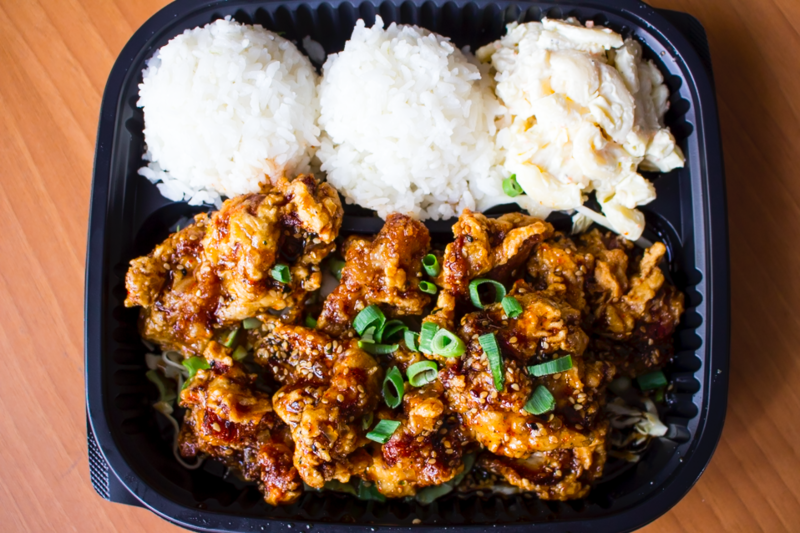 Korean fried chicken from Zippy’s consists of tender pieces of chicken fried and then smothered in a sauce made of shoyu, brown sugar, garlic, red pepper, and sesame seed, and garnished with green onion. They offer it in the classic plate lunch style with two scoops of rice and mac salad. If you’re attempting to feel less guilty about indulging in this fried masterpiece, they even offer it as a salad. 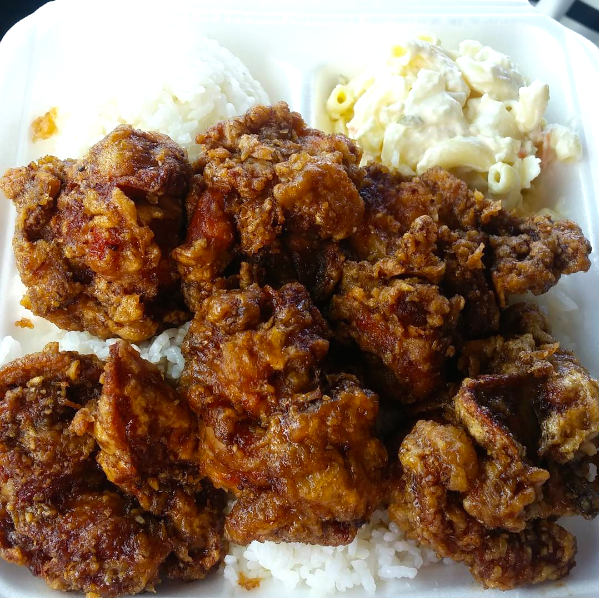 Another local favorite fried chicken: mochiko chicken. The name comes from the recipe’s use of mochiko flour, a gluten-free sweet rice flour, which gives the skin a unique texture that’s the perfect balance of crunchy and chewy. The chicken is cut into bite-sized pieces and soaked overnight in a marinade consisting of mochiko flour, cornstarch, shoyu, sugar, garlic, ginger, and sesame seeds. It’s then fried in hot oil until golden brown and crispy. 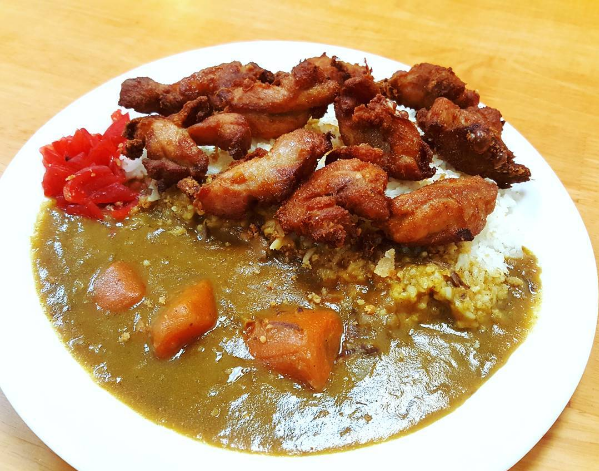 A common way locals enjoy eating mochiko chicken is with Japanese curry and rice. Or if you want a twist on an American classic, stop by The Nook Neighborhood Bistro and try their mochiko chicken with mochi waffles. It’s everything you love about the duo, just chewier and gluten-free. If you’re a visitor the islands and ask for soy sauce, don’t be startled if you get some weird looks. That’s because in Hawaiʻi, we use the Japanese word shoyu instead of soy sauce. Shoyu chicken is pieces of chicken, usually the thighs, simmered in a marinade including shoyu, sugar, garlic, and ginger. It’s a popular dish in a plate lunch, garnished in green onion and accompanied with rice and mac salad. Chicken laulau, chicken long rice, chicken lūʻau…it’s no question that chicken is a prized protein on the Hawaiian food plate. Fun fact: the Hawaiian word for chicken is moa. So if you want to say “delicious chicken,” you’d say “moa ʻono.” Now, with all this information, you have 11 reasons to come to Hawaiʻi and try our delicious chicken dishes.